Mumbai Indians’ three-match winning streak came to an end on Saturday against Rajasthan Royals who beat them by four wickets as they failed to defend a solid total of 187/5 as their bowlers struggled to contain the Royals’ batsmen. Alzarri Joseph’s impressive start to this IPL campaign took something of a knock as he conceded 53 from his three overs and injured himself while fielding which could now rule him out for the remainder of the tournament. However, they have Lasith Malinga to come in for him as a perfect replacement. Quinton de Kock finally converted a start into a big score as he hit 81 against the Royals, while it seems highly likely that Pollard and Hardik Pandya will continue to bat at four and five unless they lose early wickets as they are clearly the form strikers in the middle order right now. It came at the seventh time of asking, but Royal Challengers Bangalore finally got their first win of IPL 2019 as they overcame Kings XI Punjab’s total of 173/4 with relative ease as Virat Kohli and AB de Villiers both hit half centuries to guide them to victory with the loss of just two wickets. The reliance on Kohli and De Villiers with the bat, and Yuvendra Chahal with the ball remains far too great as they are the only players making significant contributions right now which is not sustainable. So even though they picked up their first win, they still have major concerns over the team. After the victory over Kings XI, there is every chance that the Royal Challengers will remain unchanged for this match. The improved form of Moeen Ali with the ball especially is making a big difference to them and they will hope that continues. There has been a feeling relief around the Royal Challengers Bangalore camp after their win at the weekend and they will be desperate to replicate that performance here. They felt they should have beaten Mumbai in the first match between the two teams which they lost by six runs so they will be keen to avenge that loss. 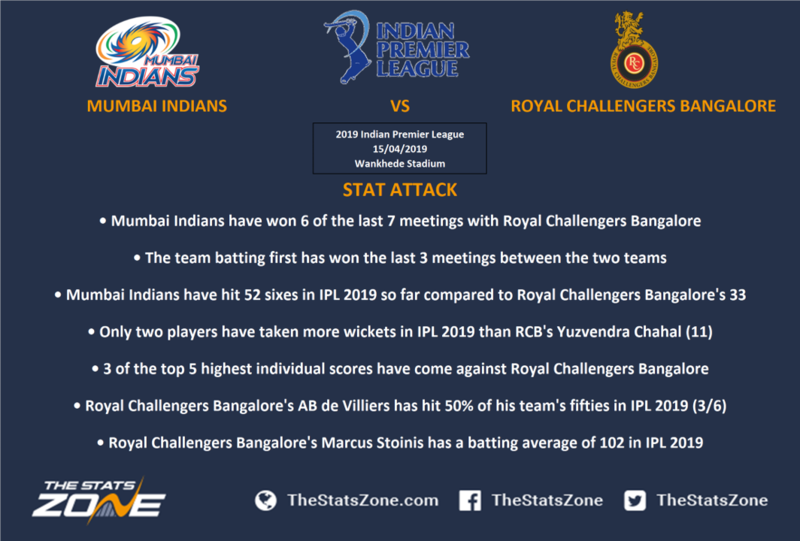 Mumbai took their eye off the ball a little in their loss to the Royals but the injury to Joseph may be a blessing in disguise as Malinga will come back in. Other than their loss to the Royals, they are actually in better form now than when they played RCB earlier in the tournament and they should have enough quality to bounce back here.